Unlike most crustaceans, Slipper Lobsters are not opportunistic omnivores (translation= they eat everything) not to be trusted when hungry; which is all the time. When available they are interesting, relatively undemanding captive species. 1) Metamerism: a division of the body into definite segments. 2) A pair of appendages per segment (at least in the primitive condition). 3) A nervous system with a dorsal, anterior brain, ventral nerve cord and ganglionic swellings in each segment. 5) Chitinous exoskeletons that cover the entire body; growth through periodic molting. 6) A muscular system that moves the animal by pulling on the exoskeleton. Class Merostomata. The living horseshoe craps and fossil eurypterids. Class Symphyla. The symphylans (of course!). Class Pauropoda. The (what else?) pauropodans. Subphylum Crustacea: About 42,000 species of some of the most familiar athropods; crabs, shrimps, lobsters, crayfish, wood-lice (sow-bugs, rolly-pollies, you know, terrestrial isopods). Many small members in fresh and marine habitats of importance in aquatic food chains. Primary aquatic. 1) Heads more or less uniform with five pair of appendages: two pair of antennae (this feature is distinctive in the phylum); the third pair as opposing, biting, grinding mandibles. Behind the mandibles two pair of accessory feeding appendages, the first and second maxillae. 2) Trunks composed of distinct segments covered by a chitinous exoskeleton strengthened by deposition of calcium salts. 3) Crustacean appendages are typically biramous (two major elements). 4) They typically have a carapace covering the trunk of their bodies. Enough of this detail. We'll cover this stuff in more general survey pieces of the mega-groups. On toward the lobsters. Class Malacostraca: comprises almost three-fourths of all described species of crustaceans and most of the larger forms, such as crabs, lobsters, and shrimps. Characteristics: Trunks typically composed of 14 segments plus the telson ("tail"); the first 8 segments form the thorax, the last 6 the abdomen; all segments bear appendages. Four Superorders: Syncarida, Hoplocarida, Peracarida, and the one we want to talk about, the Eucarida. Family Scyllaridae, the slipper, Spanish, locust, shovel-nosed lobsters (at last!). The family was established by Latreille in 1825. About 70 species having broad and flat bodies, short and scale like antennae, and eyes in sockets in the carapace. From ten to fourteen inches in length, weights to five pounds. Approximately twenty species of varied importance to us as food items or tank-specimens. Although distributed around many of the world's coastal waters, shallow to 2,000 feet, slipper lobsters are nowhere found in large quantities. Most often offered is Scyllarides aequinoctialis, the Spanish slipper lobster and S. delfosi, the vermilion slipper lobster from south Florida and the Caribbean Sea, Scyllarides astori from southern and Baja California, S. martensi imported from southern Japan and the super-flattened Ibacus peronii from eastern Australia and I. ciliatus is a common shovel-nosed lobster imported from the Philippines. I'll never complain about the cichlids or characins again! Arctides regalis Holthuis 1963, the Red-Banded Slipper Lobster. Tropical Indo-Pacific. Keep one to a tank, and not with Urchins which they will eat. Nocturnal, need hiding spaces by day. Eat most foods. Keep tank covered, capable of launching themselves out. 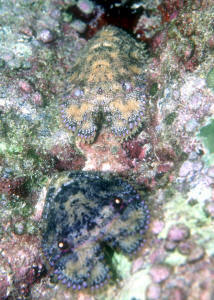 Parribacus antarcticus, the Sculptured Slipper Lobster. Circumtropical but mainly caught out of the tropical West Atlantic for aquarium use. Nocturnal, and wary of humans. Capable of great bursts of strength, speed in swimming backward. One out at night in St. Lucia in the Caribbean, another off of Hawai'i's Big Island. Scyllarides latus (Latreille 1803), the Cape Town Lobster. Mediterranean, eastern Atlantic. To a foot in length. Best kept one to a tank (they fight) and with robust fishes (they might eat them). Needs cover, nocturnal feeding. For those so disposed to collecting their own, a reference (Anon.) is offered in the biblio. I've hand-gathered specimens with simple hoop nets with ease. These species can "snap back" as other lobsters with some force. Owing to a lack of sharp or crushing claws or mouth parts, handling individuals poses little danger. A principal risk is "pinching" of fingers between hard and sharp processes on the tail (abdominal) segments' edges. Lobsters are benthic animals adapted for crawling and inhabiting holes and crevices of rocky and coralline habitats. They will only thrive when/where provided with similar environs. Friese (1984) mentions the use of this family's larger paddle-shaped antennae's function for digging into soft sand or mud. I have witnessed successful keeping of scyllarids in fine crushed substrates and in systems with just plenty of nooks and crannies. Slipper lobsters can demonstrate extreme sensitivity to very low concentrations of trace materials. Lobsters have millions of chemo-sensory hairs distributed over large areas of their bodies, known to function in food-gathering and pheromonal behaviour effects (like finding a mate), orders of magnitude more sensitive than our own. Consistency is important in water characteristic parameters. I opt for "older", more established conditions, with an abundance of carbonaceous material (gravel, rock, coral skeletons...), with an eye on higher/optimized alkalinity. The prodigious use of frequent partial water changes and chemical filtrants gets most everyone by. Wet/dry if you can afford it; slipper lobsters have been kept in all types of systems with adequately large processing/capacity: open, closed, simple undergravel to higher tech. Make a patch reef along the back or corner area, with an open soft-substrate pit near the front. Not generally a problem according to the literature and common experience, as far as slippers with slippers go. Other lobsters, large crabs and the typical bad boys (triggers, puffers, large angels, large true eels, octopi...) will go after them with little provocation. Transport in a darkened confining container, don't dip, don't feed immediately, don't bug the bug! Leave them alone and make sure their tankmates do the same for a few days. Copulation is the general rule for crustaceans, the male having specialized appendages modified for clasping and delivering the sperm to the female. The young go through a metamorphic postembryonic development as planktonic (I hope you're in the mood for this) phyllosoma> puerulus, nisto or pseudibaccus zoeal to postlarval stages in the upper water column before settling. All these bizarre molts/instars have I-can't-believe-it's-what-it-is appearances, let alone spiffy peculiar terminology. If you're interested further, route the biblio.. Crawl around on their shortened legs, dig around with the same and shovel-like second antennae, can/may "flip" their tails when sufficiently agitated, enough to leave the bottom temporarily. Slipper lobsters respire by way of gills which also serve as a primary site for the excretion of ammonia. Be aware that under certain conditions/situations this amount of ammonia can be large and suddenly change, and yes, toxic. Excess, over-feeding and rapid lowering of specific gravity ("saltiness") in particular bring on increased excretion. On the latter point, most crustacea produce a urine that is isosmotic (about equal in water pressure/concentration) with their blood, which is strongly influenced by the solute make-up and concentration of the surrounding waters. Once again, my pitch for frequent partial water changes with product of a consistent high quality and parameters (pH, density, temperature...). Sense organs include compound eyes, statocysts ("stone-organs" used in spatial assessment), sensory hairs (principally on the legs, mainly for taste), and proprioceptors (touch and stretch sense). Scyllarids have a great range of feed-stuffs. 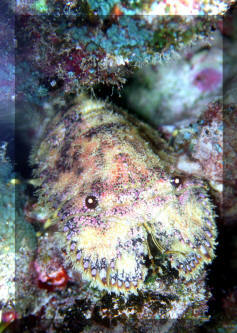 Like other crustaceans, their mouths are ventral and the digestive tract is straight. Their foregut is enlarged and equipped with walls that bear opposing chitinous ridges, denticles and calcareous ossicles. All this serves a triturating (chewing) function. Choat et al. reported a diversity of prey groups eaten by various slipper lobsters, including mollusks, actinarians, and polychaete worms. 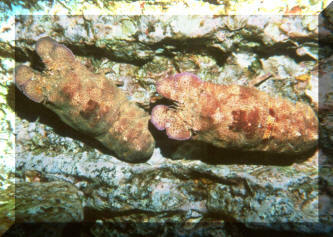 Scyllarides squammosus is a specialist , with mollusks comprising the most important prey group. According to Rudloe the gregarious, non-aggressive slipper lobster Scyllarides nodifer, is a likely aquaculture species (for human consumption). Growth from post-larvae to a 300 gram animal is hypothesized to require nine to ten molts and approximately 18 months. "No problems of disease, malnutrition or water quality were encountered." They're oddly marked, ofttimes beautifully colored, bizarrely shaped, friendly (no big claws); they're the scyllarids! The best lobsters for captive marine systems. Fenner, Bob. 1992. Viva Zapata! Slipper Lobsters. FAMA 9/92. Townsville, Australia, 8th-12th August 1988. Vol. 2. Papers Rudloe A. 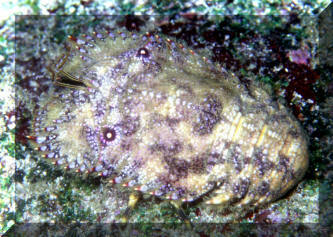 Preliminary studies of the mariculture potential of the slipper-lobster Scyllarides nodifer.